The Decorative OEUVRE of Rusty Arena with his Untitled 1, 2012 Arena Design's Cartouche in Provence white on Belgium linen RUSTY ARENA Arena Design's reissued Caligraph in charcoal on Belgium linen Houston's Rusty Arena — the wizard of wall covering, the maestro of fabric — is toasting 25 years at the helm of a brilliant design practice. Catherine D. Anspon has a sit-down (on a settee upholstered in Arena's Caligraph fabric, no less) with the famously low-key artist and artisan to look back on where it all began and find out what's next. (Hint: We're seeing water.) PHOTOGRAPHY ALEFIYA AKBARALLY FROM HSPVA TO KIPS BAY From Betty Ewing's Houston Chronicle columns to the pages of Veranda and Architectural Digest, Rusty Arena has metamorphosed from the kid most likely to succeed in the inaugural class of 1973 at Houston High School for the Performing and Visual Arts to the darling of the national design firmament. This is a talent whose extraordinary hand-printed wallpaper and textiles are both timeless and contemporary. If we were to compare Arena to a modern art-world talent, it might be Cy Twombly, an artist whom he admires. Like Twombly, Arena is adept at channeling the beauty and resonance from times past to today. Even the monikers of his wall coverings and textiles hint at sources and inspirations from lost civilizations, other worlds, the ancients and the antique — Santorini, Cartouche, Valmont. In the two and half decades since Arena Design launched, its protagonist has segued from trompe l'oeil and faux finishes to his signature creations: hand-painted wallpapers and fabrics. He forays successfully into both, and his work draws gasps for the subtle way that light plays on the hand-blocked bolts of velvet. He's also earned accolades from Carolyne Roehm for the opulent wall covering he crafted for Susan Gutfreund's library in the New York Kips Bay Show House (the hand-painted and handprinted jute hereafter titled Avian Kips Bay). TRUMPING TROMPE L'OEIL Arena reveals dual epiphanies in his oeuvre. After a nasty painting critique at the Museum of Fine Arts, Houston's school in the mid1970s, he came home frustrated and decided to move his work permanently from canvas to the walls of his home — and began enthusiastically hand-painting everything in sight. A decade later, he was going strong as the faux finisher/trompe l'oeil man about town, with scores of significant national commissions. When a custom faux painting project in Lawrence, Kansas, in the 1990s stretched on for months, Arena vowed to begin replicating his designs on wall coverings, which could be transported to the site instead of himself. 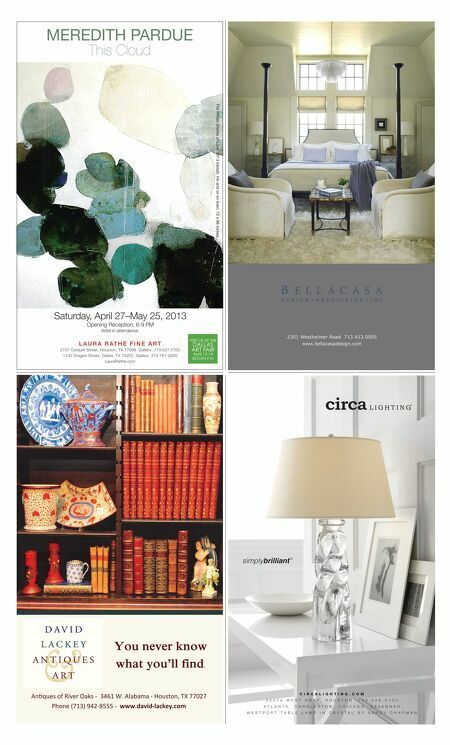 And thus was born Arena Design, which is represented today in eight showrooms across the country. 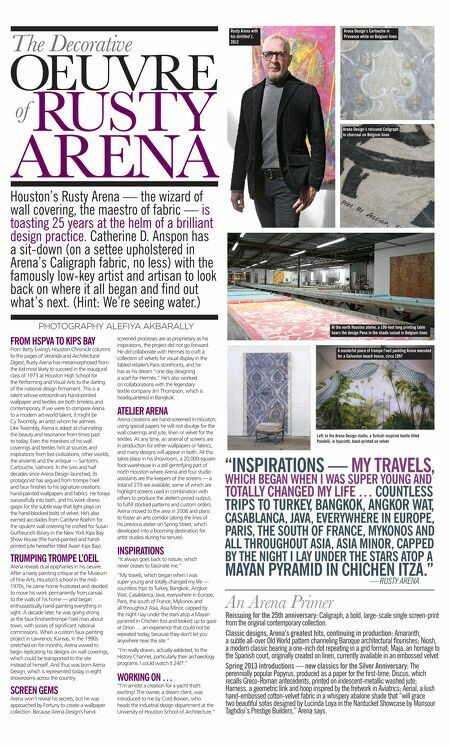 SCREEN GEMS Arena won't reveal his secrets, but he was approached by Fortuny to create a wallpaper collection. Because Arena Design's hand- At the north Houston atelier, a 100-foot long printing table bears the design Pena in the shade sunset in Belgium linen screened processes are as proprietary as his inspirations, the project did not go forward. He did collaborate with Hermès to craft a collection of velvets for visual display in the fabled retailer's Paris storefronts, and he has as his dream "one day designing a scarf for Hermès." He's also worked on collaborations with the legendary textile company Jim Thompson, which is headquartered in Bangkok. A masterful piece of trompe l'oeil painting Arena executed for a Galveston beach house, circa 1997 ATELIER ARENA Arena creations are hand-screened in Houston, using special papers he will not divulge for the wall coverings and jute, linen or velvet for the textiles. At any time, an arsenal of screens are in production for either wallpapers or fabrics, and many designs will appear in both. All this takes place in his showroom, a 20,000-squarefoot warehouse in a still gentrifying part of north Houston where Arena and four studio assistants are the keepers of the screens — a total of 279 are available, some of which are highlight screens used in combination with others to produce the atelier's prized output, to fulfill stocked patterns and custom orders. Arena moved to the area in 2006 and plans to foster an arts corridor (along the lines of his previous atelier on Spring Street, which developed into a booming destination for artist studios during his tenure). INSPIRATIONS "It always goes back to nature, which never ceases to fascinate me." "My travels, which began when I was super young and totally changed my life — countless trips to Turkey, Bangkok, Angkor Wat, Casablanca, Java, everywhere in Europe, Paris, the south of France, Mykonos and all throughout Asia, Asia Minor, capped by the night I lay under the stars atop a Mayan pyramid in Chichen Itza and looked up to gaze at Orion … an experience that could not be repeated today, because they don't let you anywhere near the site." "I'm really drawn, actually addicted, to the History Channel, particularly their archaeology programs. I could watch it 24/7." WORKING ON … "I'm amidst a creation for a yacht that's exciting! The owner, a dream client, was introduced to me by Cord Bowen, who heads the industrial design department at the University of Houston School of Architecture." Left: In the Arena Design studio, a Turkish-inspired textile titled Pandelli, in hyacinth, hand-printed on velvet "INSPIRATIONS — MY TRAVELS, WHICH BEGAN WHEN I WAS SUPER YOUNG AND TOTALLY CHANGED MY LIFE … COUNTLESS TRIPS TO TURKEY, BANGKOK, ANGKOR WAT, CASABLANCA, JAVA, EVERYWHERE IN EUROPE, PARIS, THE SOUTH OF FRANCE, MYKONOS AND ALL THROUGHOUT ASIA, ASIA MINOR, CAPPED BY THE NIGHT I LAY UNDER THE STARS ATOP A MAYAN PYRAMID IN CHICHEN ITZA." — RUSTY ARENA An Arena Primer Reissuing for the 25th anniversary: Caligraph, a bold, large-scale single screen-print from the original contemporary collection. Classic designs, Arena's greatest hits, continuing in production: Amaranth, a subtle all-over Old World pattern channeling Baroque architectural flourishes; Niosh, a modern classic bearing a one-inch dot repeating in a grid format; Maja, an homage to the Spanish court, originally created on linen, currently available in an embossed velvet Spring 2013 introductions — new classics for the Silver Anniversary: The perennially popular Papyrus, produced as a paper for the first-time; Discus, which recalls Greco-Roman antecedents, printed on iridescent-metallic washed jute; Harness, a geometric link and hoop inspired by the fretwork in Aviatrics; Aerial, a lush hand-embossed cotton-velvet fabric in a whispery abalone shade that "will grace two beautiful sofas designed by Lucinda Loya in the Nantucket Showcase by Monsour Taghdisi's Prestige Builders," Arena says.